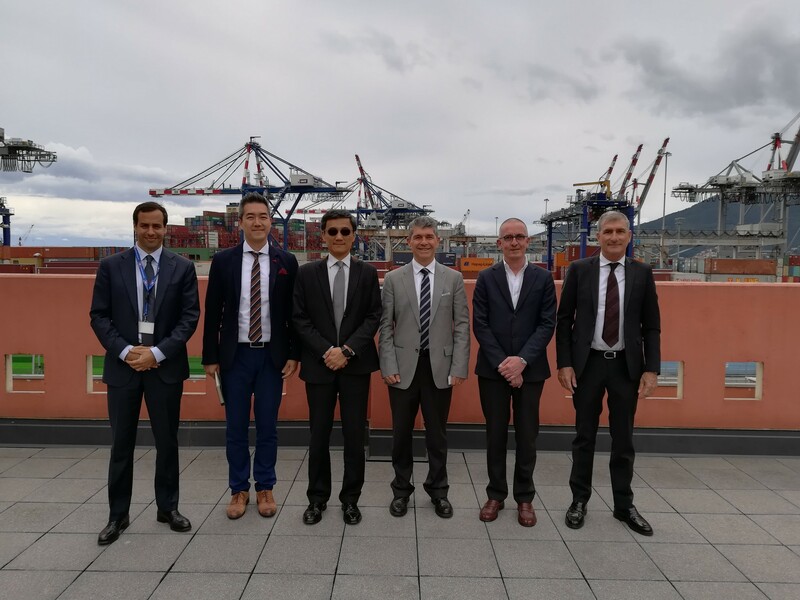 In the morning of Tuesday May 15th, La Spezia Container Terminal (LSCT) gave its warm welcome to a delegation representing the Italian agency of long-term customer Evergreen Maritime Corp. The group of guests was headed by Mr Chi-Yi Cheng, recently appointed President of the Evergreen Shipping Agency (Italy), accompanied by Mr Chien-Hung Lin, Junior Vice President Logistics Department, and Alessandro Andreani, manager of the Italian Sisam agency. The visit marked the occasion to review many topics of the fruitful business relationship between LSCT and Evergreen, presenting both the maritime and intermodal transport opportunities available at Contship Italia’s North Tyrrhenian gateway terminal and through the Contship logistics system. By chance, a ship of Ocean Alliance’s service MD2 – one of the four Asia Med strings calling LSCT weekly – was being operated alongside the Fornelli East berth (as seen in the group picture) during Evergreen’s visit. Welcoming the delegation was Raffaello Cioni, Commercial Director of Contship Italia’s Maritime Sales, Antonio D. Testi as LSCT General Manager, Roberto Scotto as LSCT Customer Service manager and Peter Robino of the Contship Italia Maritime Sales department.